OK, that last post was a bit heavy, so to distract myself and lighten the tone I've been pondering about the things that make breastfeeding a toddler different to breastfeeding in the early months. It's one thing nursing a little baby who can barely support it's own head and who can only coo or cry – when you've got a little person who is fully mobile and almost talking like an (albeit, fairly drunk) adult it's a whole different ball game! How many of these do you recognise? 1: The naming – OK, I've covered this one before, but I still think hearing Toddler ask for 'mummy milk' is immensely cute ... most of the time. However, when we're going through the supermarket and she yells, "WANT SOME MUMMY MILK," I kind of miss the days when her only means of requesting said mummy milk was gnawing at her own fist. 2: The shape throwing – I've heard it called gymnurstics, I've heard it called lactobatics. Whatever you call it, it's ... umm ... interesting. Toddler's piece de resistance is balancing with one foot on my leg, the other in the air, bottom above her head and arms outstretched. It's quite something to behold. 3: The multitasking – Toddler will regularly leaf through a book while feeding. Often a big hardback with nice pointy corners to jab me with. And then there's the attempts to continue talking/singing through a feed: "Old MacDonald had a mmm, mm-mm mm-mm O!" 4: The need for an object – Linked in with the last one, anyone else have a toddler who just has to have something to hold onto whilst feeding? This started a few months back when Toddler was getting in a pickle because I asked her if she wanted to play with her trains or have mummy milk. Turned out the answer was both! 5: The 'subtle' comments – OK, this one isn't ToddlersT doing. And it's probably quite universal. Seems that however you feed your child, other people will have an opinion, and some will feel the need to 'hint' at that opinion. And feeding beyond infancy seems to attract a lot of 'hints'. From the person who tells you how they once heard someone say breastfeeding a toddler is weird, to the person who suggests to your child that she's too old now, other people will find a way of indirectly expressing their view on the matter. Well-meaning, I'm sure. And at least it's not outright condemnation. Sigh. 6: The snuggles – Everything above considered, the best bit by far, the absolute icing on the cake, of breastfeeding a toddler is the cuddles. A newborn wants cuddling ALL THE TIME. A toddler has far too busy a schedule, thank you very much. What with re-imagining her bedroom furniture as an assault course and acting out episodes of 'Charlie and Lola' with a range of farm animal finger puppets, sometimes the only chance I get for a cuddle with Toddler is when she's feeding. And for just a few minutes, I can sit back and relax, my lovely bundle in my arms, and remember how sweet it was to hold that much smaller bundle all those months and years ago. And then she's off again. "She's had some really bad news." You may have noticed I haven't blogged much this month. (What do you mean, you haven't? You hang on my every word, right?) That's because this month got off to a pretty bad start. At around 7am on Friday 1st August, just as I sat down to breakfast, I got a phonecall. Or rather, my husband did, from my mum. When my mum calls my husband's phone, I know that means it's bad news – she does it to make sure I've got someone with me. As he talked to her a number of scenarios raced through my head, but not one of them was close to what had actually happened – my aunt had died, completely out of the blue. We learned a week later that she had been ill for a while, but nobody knew this – she probably didn't know it herself. I could make this blog post a tribute to her, but really, I don't think I have the words to express what a wonderful, inspirational woman she was. Instead I want to talk about the impact the news had on my parenting. As I burst into tears that day, Toddler became deeply upset too, and my husband took her out of the room to try and calm her. I didn't tell her what had happened – I didn't feel up to explaining it to her, and besides, it was seven months since she'd last seen my aunt, so I didn't think she needed to know straight away. So we just said I'd had some really bad news. But as the day wore on, my obvious distress was making her very upset, and the smallest thing was setting her off into a full-blown tantrum. I decided that the best thing I could do for her was to go out for a bit, so I left her with her dad and went to see my cousin. It was a hard decision to make. Having practised attachment parenting/ gentle parenting since Toddler was a few months old, I was used to being her main source of comfort, her rock. But that day I was a very shaky rock, and I was bringing distress rather than comfort. It was hard to admit it, but she needed space from me at that time, and I needed space from her. One thing that has surprised me about the effect grief had on my parenting was the way my patience seemed to wear thin so much more easily. When I went home that day, I found Toddler's high emotions, testing at the best of times, deeply frustrating. I'd spent the last few hours with people who were deeply grieving, I was grieving myself, why did she have to cry over not having the right toy to play with? It's that frustration that I'm still struggling with. It got easier for a while, but the funeral was last week, and that has made the grief feel very raw again. I've found myself with very little patience for Toddler's perfectly normal toddler behaviour – her refusal to follow instructions, her tendency to mess about when I'm trying to get her changed, her tantrums, and recently her nap refusal. Being a gentle parent feels really, really hard right now. "it's hard to be there & present for someone else's needs when our own needs are unmet ... Self-compassion." This really struck a chord. I realised the reason I was being so impatient and snappy was because I simply don't have the headspace to remember how to be a gentle parent right now. There's a large part of my mind still desperately trying to grapple with the fact that my wonderful, active and apparently healthy aunt is gone from this world forever. I'm still deeply worried about the effect this is having on my relatives. Remembering all those tactics to stay calm and handle the challenges my spirited and independent girl will inevitably throw at me is just beyond me right now. The trouble is, the only thing that will fix this is time. In time, I'll come to terms with what has happened. In time, those who were even closer to my aunt will adjust to life without her, although we will, of course, all miss her deeply and unendingly. But while that time passes, I need to carry on being a parent, and raising my daughter in the gentle way I believe is right for us. How I'll manage this, I don't quite know yet. But I know I need to be gentle with myself, too. Thank you to those lovely mums who comforted me on Saturday night without even knowing why I was down, your kindness means a lot to me. When I was a child I went to a childminder. I don't have many recollections about that time, but one thing which has strangely stuck in my mind was the time when, after finishing my lunch, she told me to put my knife and fork together on my plate. I didn't understand what she meant and tried several different positions, all with the tips of the knife and fork touching - because that's together, right? But every time I tried, she would say, "no, put them together," in an increasingly exasperated tone until she lost patience and put them side by side for me. Only then did I realise what she meant. I felt pretty stupid. What has this got to do with breastfeeding? Well, the other day I was talking to a friend who said that she'd read (I don't know where) that all the pressure to breastfeed is stopping new mums from even trying because they don't want the hassle. Having not read the source I don't know how true this is, but it does point to a problem, or a perceived problem, that there is more pressure than there is support. Telling someone to do something is useless unless that someone is shown how to do it, much like my childminder repeating an instruction over and over when I needed to be shown what she meant. 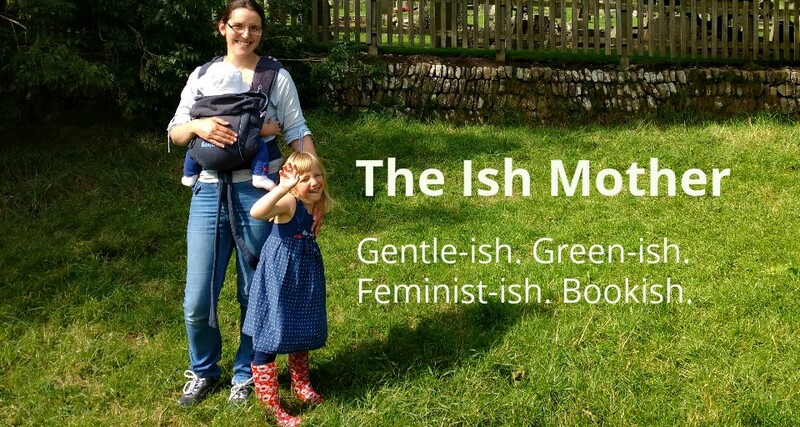 It's quite hard for me to write about this topic, as actually, I didn't feel pressured to breastfeed at all. I was asked at one of my midwife appointments how I planned to feed and I said I wanted to breastfeed, and that was it. Of our three NHS antenatal classes, half of one session was devoted to watching a DVD about breastfeeding and asking some questions afterwards. And when my Health Visitor paid her first visit she gave me some leaflets and a little demonstration with a doll and a knitted breast (which I found rather comical). Personally I didn't feel that constituted pressure, but then I wanted to breastfeed, so the information was useful. Similarly, after birth I didn't feel particularly pressured. At one point when I was really struggling my husband said he thought I was being put under a lot of pressure, but I didn't see it that way. Yes, I had a lot of midwives giving me advice, and when I mentioned feeling like giving up and using formula they would just give more advice - but that was exactly what I wanted them to do. To me it was support, it was encouragement. When I said I was thinking of giving up I expected them to agree with me, and I knew that I'd be heartbroken if they did. So their continued advice gave me the courage to just keep trying until I cracked it. I don't doubt that there are genuine instances when mothers are actually pressured - I've read stories of women being told they were bad mothers and didn't love their child enough if they gave up. But equally, I've probably read a similar number of stories about mothers being pressured to give formula for health problems such as slow weight gain or reflux, even though in the cases where the mothers persisted in breastfeeding these problems did work themselves out in the long run. So when does promotion become pressure? I think the big problem lies in what happens in those few weeks after birth, perhaps even in the few days after birth. I was in hospital for three days, and if I'd left sooner I'm not sure I'd have been able to carry on breastfeeding, but a lot of women are rushed out after 24 hours or sooner. When in hospital, midwives are overstretched and just don't have the time to support women who are having difficulty with feeding. Back home, one midwife visit a day (if that) is not enough to keep breastfeeding going when things are tough - mothers need access to support groups, breastfeeding counsellors, peer supporters etc. Support groups aren't always easy to get to, and counsellors and supporters are usually volunteers who, wonderful and dedicated as they often are, have their own lives and therefore may have limited time. There is the option of seeing a lactation consultant, but my understanding is that many of these charge (as they are generally not employed by the NHS) so new parents with all sorts of other money concerns may not feel able to afford this service. And besides, are new parents told that this support is available? I was given a leaflet with the numbers of local breastfeeding counsellors (of the two in my town, one had given up counselling and the other didn't seem forthcoming with help - although I may have just got her on a bad day) but it was months later that I heard the term 'lactation consultant'. This all adds up to a situation like little me desperately trying to figure out how to place my cutlery without being properly shown, then feeling embarrassed and ashamed that I couldn't. As much as pressure may be in the eye of the beholder to some extent, promotion without proper follow-up support will lead to mothers not being able to breastfeed then feeling guilty about it. I don't know what the answer is, but I think that more funding to allow for increased midwife numbers (in the wards and in the community), more support groups and more access to professional support such as breastfeeding counsellors and lactation consultants would certainly help. That funding, however, doesn't seem forthcoming as this government just doesn't see breastfeeding as a priority. In the meantime, we'll just have to help each other. I have huge admiration for mothers who give up their time and money to train as peer supporters and breastfeeding counsellors, whose only payment is the knowledge that they're helping other mums. But even without that training, I think we can all play a part in normalising breastfeeding, talking about the highs and lows, offering support to friends and family members (even if that is just bringing a meal round so a mum can have an extra hour to focus on feeding instead of cooking) and generally showing that it can be done, in an unpressured, non-judgmental way. If women are being put off by all the pressure to breastfeed, that's really sad. If you feel like that, please know that support is available, you may just need to do a bit of digging to find it. You don't have to figure it out on your own. And, when it does work out, it really is a wonderful thing.